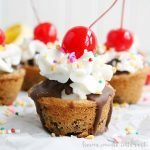 Delicious cookie dough baked into cups and filled with chocolate, banana slices, whipped cream and of course a cherry on top. Preheat oven according to instruction on cookie dough package/recipe. Roll chocolate chip cookie dough into 1 inch balls. Using a mini muffin tin place one ball in each muffin spot, and using your tart tamper (or your fingers) press the dough down creating a cup shape. Bake the cookie cups according to the instructions on the cookie dough package/recipe. Once cookie cups have baked remove them from the oven and use the tart tamper again to press the cookie down where it has puffed up. Let the cups cool completely. Add a banana slice to the bottom of each cookie cup. Use a melon baller to scoop one scoop of ice cream into each cookie cup. Top with Magic Shell and let it harden. Finish with whipped cream, sprinkles and/or nuts and a cherry on top.